Clean the oxtails and pat them dry. Heat oil in a large skillet over medium high heat and brown them on all sides. Remove the oxtails and put in slow cooker. To the pot, add the ginger, garlic, star anise, cloves, and bay leaves. Cook for about 2 minutes. Add cooking wine to deglaze. Add dark soy sauce, light soy sauce, rock sugar, water, and salt. Add daikon. Bring to boil. Add to slow cooker on low. Add enough boiling water to cover. Simmer for 4 hours, until the meat is tender. Add additional water if necessary to avoid sticking. Lightly flour the beef cubes and sear on all sides until light brown. Add to crockpot with the cubed turnip/daikon/carrot. Sauté the shallots, garlic, ginger until fragrant. Add the aromatics ingredients for a quick sauté. Add the sauce ingredients, stir in 3 cups chicken broth. Bring to a boil. Add boiling sauce to crockpot. Now add remaining boiling chicken broth to crockpot until ingredients are covered. Cook for 2 hours on high. Add the bean curd sticks. Continue cooking for 4 more hours, or until beef is tender. Let sit overnight for best flavor. Good on tacos, Mexican food, etc. Place dry ingredients in slow cooker. Pour boiling water or broth on top. Strain beans and reserve liquid. Use immersion blender to mash beans, adding liquid as needed until it’s the consistency you want. In large crockpot, add ½ gallon milk and turn on low for ~1-2 hours, until 180*F.
Remove lid and cool down until 115*F. This temp should be accurate within 5*F to not kill the yogurt culture. Stir in yogurt and powdered milk (if using). Turn off crockpot. Replace lid. Cover in a super heavy towel and let sit for 8 hours at 110-120*F.
Turn on crockpot to low every 3 hours for 10 minutes to maintain temp. 1. Dry beef with paper towels then season with salt and pepper. Heat 1 Tbsp oil in large skillet over med high heat until just smoking, add half of beef and brown on all sides about 8 min. Transfer to slow cooker and repeat with remaining beef. 2. Add 1 Tbsp oil, onions and ¼ tsp salt to the empty skillet and cook until golden brown about 6 min. Add tomato paste and cook stirring well for 2 minutes. Add broth and soy sauce, bring to simmer and transfer to slow cooker insert. 3. Toss carrots, parsnips, potatoes ½ tsp thyme and remaining 1 Tbsp oil in a large bowl. Season with salt and pepper. Wrap vegetables in a foil packet that will fit in the slow cooker, folding over the seam to trap steam. Stir bay leaves and tapioca into slow cooker with the meat and onion mixture. Set the vegetable packet on top of beef. 5. Transfer vegetable packet to a plate. Open and pour vegetables and juices into the stew. Add remaining 1 tsp thyme and peas. Let stand until the peas are heated through. Season with salt and pepper to taste. 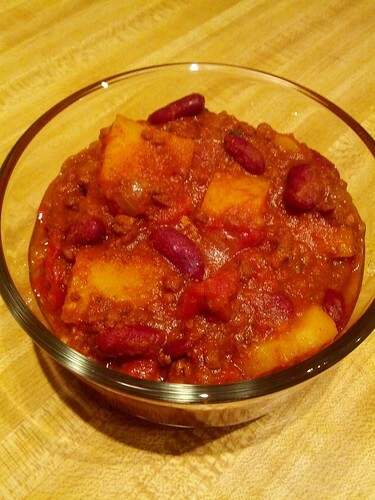 Amazing chili that can be made in the crock pot. Cooks Illustrated suggests making the chili at least a day in advance, up to five days, as the flavor gets better with time. We made some adjustments as we don’t like a very meaty chili and I grew up eating chili with potatoes, so we added them. Heat oil in large heavy-bottomed stock pot over medium heat until shimmering but not smoking, 3 to 4 minutes. Add onions, bell pepper, garlic, chili powder, cumin, coriander, pepper flakes, oregano, and cayenne; cook, stirring occasionally, until vegetables are softened and beginning to brown, about 10 minutes. Increase heat to medium-high and add half the beef; cook, breaking up pieces with wooden spoon, until no longer pink and just beginning to brown, 3 to 4 minutes. Add remaining beef and cook, breaking up pieces with wooden spoon, until no longer pink, 3 to 4 minutes. Add beans, tomatoes, tomato puree, and ½ teaspoon salt; bring to boil. Transfer the mixture to a slow cooker. Cook the chili on the high setting for four hours. After 2 hours, add the diced potatoes, covering with sauce. Serve hot, though the flavor is best if left overnight. Optional items for garnish: fresh lime wedges, sour cream, green onions.